New logos are typically controversial. Rarely do they receive universal acclaim, and to create something original and dynamic usually means that criticism will follow. The logo that will accompany the new AFL Women’s competition, as it was officially named last week, is no different. The first thing you notice is how different it is from the existing AFL logo, which judging by the images above, it is intended to sit alongside. Without knowing more about the brief or the designers behind it, I’m guessing that this was intentional. It would have of been easy to just lazily stick the word ‘Women’s’ underneath it, similar to the AFL-Tasmania logo. Or embed a smaller AFL logo inside a new logo as has been done with the NEAFL or QAFL. The AFL is clearly aiming for a strong and distinct look for its inaugural Women’s league, and have offered the following explanation. 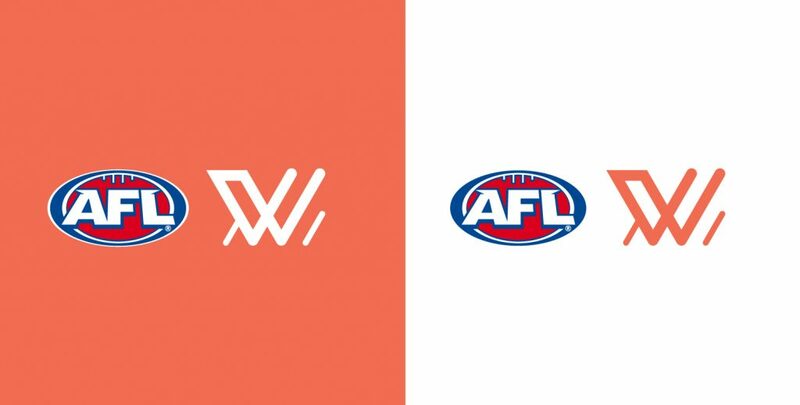 The ‘W’ logo paid tribute to the heritage of the AFL logo, with the posts and goalsquare presented in a contemporary, energetic, and youthful manner. The posts and goalsquare part may not be immediately obvious. Depending on how your brain works, you might be viewing it as from above or below. But achieving what works both as a recognisable letter and has a second function or meaning is not an easy feat. What’s also unique about this logo is how different it is from any other sporting competition. On face value it doesn’t look like a ‘sports logo’. It is so clean and sophisticated that it could well be for the latest ride-sharing or social media App. This is not a criticism, but for the logo to get some traction, at least initially, it does need the AFL logo next to it and a bit of explanation. The only alternative logo I could’ve come up with would be a silhouette of that Tayla Harris kick. Like to hear your thoughts. Way my brain works (such as it does), Mike, is I’d thought they’d put a crossbar on the goalposts. Will be interested to see how they present it, perhaps in conjunction with a sponsor’s logo. As, in a way, it will be a similar product to BBL (shortened season, presumably marketed towards an evening viewing audience it’s interesting to see the different ways they have gone with it. All cricket products start with Cricket Australia’s “shield on an angle” and then brand within that blank canvas, incorporating naming sponsor. The more I look at it the more accepting of it I become. Not sure about the colour but it is stronger than pink, could be bolder colour. I see the goal square it also looks a bit like a trolley lifting something up. Overall though these logos are so subjective, I can live with it. Actually I don’t really care about the logo. The product will sell itself. I watched the women’s final in Brisbane on Saturday night. 2 point victory to the Coolangatta bluebirds. Great game to watch. Don’t like the colour. It is neither red nor pink. Also the styalised w leaves me cold. I agree with him for a change – With my Baby Boomer wired brain and deteriorating eyesight I probably wont ever understand what this logo represents!! At least its not Teal tho! As Daly alluded to, it looks like a Volkswagon logo that’s been run over. Baffling, ugly and lacking in any redeeming features. Did I mention the putrid colour? looks like a supermarket trolley. Looks cheap and nasty. Not exactly a bold statement. Thanks for all the comments, opinions seems split. Now I can’t see anything but a run over VW logo, JD!